Buy Car Vs Rent Car, which is better? Singapore is the most expensive country in the world to own a car. To begin, there’s the MAS’ (Monetary Authority of Singapore) Motor Vehicle Financing rules that enforce car buyers to fork out up to 40% of the car cost for down payment (with effect from 27 May 2016). Adding on to that, the Certificate of Entitlement (COE) and the abundant hidden costs makes one question: Could it be more worth it to simply just rent a car? Let’s weigh the pros and con. Perhaps that might give you the required insights to make an informed decision. For the sake of a fair comparative study, we will be using a standard sedan in our analysis – the Mazda 3 1.5L Sedan. As of 23 Oct 2017, the open market value of a Mazda 3, is S$17,300. Naturally, this is far from the nett price one sees at showrooms. Firstly, there is a S$140 Registration Fee – the cost of registering a car in Singapore. An Additional Registration Fee (ARF) adds to it. This is calculated based on a percentage of the car’s Open Market Value (OMV) as assessed by the Singapore Customs. You can find out how the ARF is calculated here. In our scenario, the ARF payable for the Mazda 3 will be S$12,300. The cost of the car has now almost doubled to S$29,740. This is before factoring the COE. The COE gives ones the right to vehicle ownership and road usage for 10 years. The LTA runs a Vehicle Quota System to control the local vehicle population. To get the COE, one will need to participate in the fortnightly COE Open Bidding exercises. Like all bidding processes, it depends largely on the pool of bidders and the climate of car ownership. In this scenario, in 23 Oct 2017, the COE quota premium for the Mazda 3 (a car below 1600CC & 97kW) is S$51,890. With that, the cost of purchasing this car has bloated to S$81,630. Next, an Excise Duty of 20% on OMV has to be considered. Excise Duty, also known as Customs Duty is S$3,460 for the Mazda 3. The total cost now reaches S$85,090. The car dealer’s cut is estimated to be ~10% of selling price (inclusive of the various taxes, duties and COE). That amounts to S$8,509. The dealer’s cut varies between companies and depends partly on the sales negotiation with the car sales rep.
Now at S$93,599, we are ready to factor Singapore’s 7% Good & Service Tax (GST). The final cost of the car is now a whooping S$100,150 – the price quoted at showrooms. To pay for the car, one can borrow up to 70% of the purchase price (the % set for cars with an OMV of <S$20,000). This translates to S$30,045 for the down payment for the Mazda 3. Before collection could happen, with waiting time anywhere between 2 weeks to 3 months, one will have to pay the full down payment, the 1st instalment of the car loan ($997) as well as the car insurance premium for the first year (a Comprehensive Car Insurance for a Mazda 3 is $2,100 a year). The bottom line: it will take 2 weeks to 3 months of waiting and S$33,145 just to get the car. If one rents a car, the process is less stressful with the costs a lot more transparent too. One can immediately drive the car off upon signing the agreement (except in cases where the rental company has to purchase a new car for the driver’s use). To draw from our own example, the upfront payment for the Mazda 3 at BizLink is ~S$3,959 at the time this article is written. This considers the 1st month rental plus a month’s deposit, inclusive of 7% GST. Bearing in mind that the Mazda 3 was purchased with a 7-year repayment loan for 70% of the vehicle, let’s calculate the cost to upkeep the car per month. For a loan amount of S$$70,105, the monthly instalment would be S$997 assuming an interest rate of 2.78% which varies, depending on the institution that the car loan was from. It is advisable to check the Total Debt Servicing Ratio (TDSR) or debt obligation limits when one applies for a car loan. On top of the car loan instalments, one will also need to service a yearly car insurance. A Comprehensive Car Insurance for a Mazda 3 is ~S$2,100 a year. A yearly road tax adds S$682 to the total cost. Hence, the monthly upkeep for the ownership of the car is estimated to be ~S$1,300. For rented cars, there is no worry over road tax or car insurance. All these are part of the package at BizLink Rent-A-Car. The monthly rental for our example, the Mazda 3 is ~S$1,979.50 (inclusive of 7% GST) without additional cost. The cost for petrol, parking charges and Electronic Road Pricing (ERP) charges are excluded in the comparison since these are shared costs identical for both purchased and rented cars. It is good practice for drivers to send their cars for general servicing every 6 months (or every 10,000km of driving). This routine servicing costs ~S$200 excluding cost of repairs, replacements or new parts, if any. While it is tempting to save money by skimping on car servicing, doing so poses a risk for a much heftier bill. With the cost of servicing being a lot lesser than replacing parts due to damage from poor maintenance, it is strongly advised to keep a car well-maintained. For rented cars, free regular car maintenance is typically included in the rental package. In addition, any damaged or worn out parts that requires replacement are also replaced free of charge. At BizLink, when a car breaks down, our customers call BizLink’s 24/7 Roadside Assistance at (+65 9012 6616) where everything will be taken care of for them. They are provided with a temporary car to drive while theirs undergo repair. This is part of our effort to provide a seamless driving experience by minimising such disruptions in any way possible. In the unfortunate event of an accident, one will need to call the insurer for a tow truck and seek advice on steps following the accident. If the car is not towed, one will need to report and bring it to an approved reporting centre/authorized workshop within 24 hours or the next working day to get it checked – regardless of presence of damages. A failure to report the accident will result in a loss of the “No Claim Discount” (NCD) during the insurance policy renewal. The person(s) responsible for the accident will lose any form of discounts to their premiums and may even have them increased when they renew the policy. The insurance premium may soar up to more than 70% of the original rates once a claim is made against the driver. To avoid an increase in car insurance premiums or loss of discounts, many drivers choose not to make claims for minor accidents. That however exposes them to unauthorized tow-truck operators/repair workshops that charge exorbitant rates for the work done. In such scenarios, rented cars have lesser predicaments. One will just pay for any damages to the rented car up to the excess amount that is set in the insurance policy that comes with the rental package. For the Mazda 3 at BizLink, the excess amount is S$1,200 for local accidents. Therefore, there is no risk of paying anything more than S$1,200 for repair work when one gets into an accident. This excludes situations where our customers hit another car which would require them to pay for the other party’s damages, as is the standard practice here. When BizLink customers encounter an accident, they just have to call the BizLink Roadside Assistance hotline, and we will take care of everything. The customers only have to address the bill for the relevant damages. 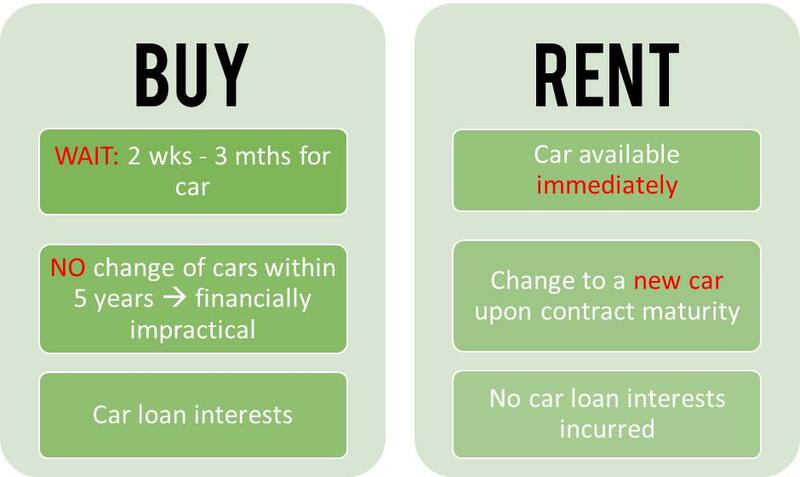 A unique advantage that car renters have over car buyers is the ability to change their cars a lot more frequently without incurring exorbitant fees. A long-term contract for rentals last around 2 – 3 years. At the end of the contract, one can choose to change to a different model and even drive away a brand new car upon recontract. On the other hand, the cost of purchasing a new car and its high depreciation rate in the first few years makes changing them every 2-3 years impractical. Typically, the earliest a person would change their purchased car would be in the 5th or 6th year. Another major advantage for car renters is the lack of debt obligation. In June 2013, MAS introduced the Total Debt Servicing Ratio (TDSR), a debt obligation calculation that encourage financial prudence as well as to facilitate bank’s assessment of borrower’s repayment ability. The TDSR is currently set at 60%, which means that one’s total monthly liabilities are capped at 60% of his gross monthly income. Liabilities include personal loans, instalments and car loans. TDSR is based on the loan tenure, loan amount, combined monthly gross income (together with the spouse’s), combined monthly debt obligations and credit card balances. The TDSR rules also applies when one wants to get a new property loan. With rented cars, the TDSR of a person is left untouched, allowing him greater flexibility with new loans or investment in a second property. In summary, it is no secret that in the long run it is cheaper to buy and own a car. However, the hefty upfront payments, the hassle of managing car ownership and the threat of high premiums after car accidents may tip the balance in favour of renting. The bonus of changing a new car every 2 – 3 years without increasing TDSR makes renting a car a very attractive option..
We hope the above information will be helpful in your decisions to get you into the driving seat.